Sometimes referred to as "the Venice of the North", Bruges is a city that will tantalise the taste buds and palpitate the heart. Chocolate shops, lace vendors and waffles are just some of the sensory delights that attract millions of tourists to Bruges each year. And, with canals that truly do rival Venice, romance is also on many folks' agenda. A trip through the canals is one of the many must-do activities on a trip to Bruges, the slow journey through winding watercourses will show Bruges from a different perspective and showcase much of the city's medieval architecture. Tours normally run from 10am - 6pm and cost 5-6 Euros for a 30 minute cruise. Another (more costly) way to tour the city is on a horse-drawn carriage ride. However, the more people you cram in the carriage the cheaper, but if seduction is the order of the day this might not be the best course of action! Carriage rental is around 30 Euros. After a cruise or trot, hunger may be rearing it's head, and the best thing to satiate this hunger - waffles and choclates of course! Stuff in as many as you can while in Bruges because they are truly delightful. Once your sweet tooth is completely satisfied, it might be best to wash down the waffles with a beer or three. There are many restaurants and cafes around Bruges that serve local beer at great prices. On top of this, with each round of drinks you are generally provided a small bowl of savoury snacks. Of course, Bruges has many historic buildings that are worth checking out. 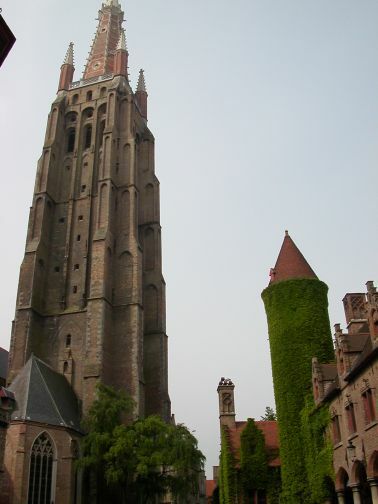 Some of the most famous include the Church of Our Lady, Bruges' 13th-century Belfry that houses a municipal Carillon comprising 47 bells, The Beguinage and the Basilica of the Holy Blood. Check your tourist guides for locations and hours. Bruges is located in the northwest of Belgium, in Western Europe.